Dear brothers and sister in Christ: The early Christians observed with great devotion the days of our Lord’s passion and resurrection, and it became the custom of the Church that before the Easter celebration there should be a forty-day season of spiritual preparation. During this season converts to the faith were prepared for Holy Baptism. It was also a time when persons who had committed serious sins and had separated themselves from the community of faith were reconciled by penitence and forgiveness, and restored to participation in the life of the church. We are reminded of the mercy and forgiveness proclaimed by the gospel of Jesus Christ. Let us therefore, renew our faith. You are invited, in the name of Christ, to observe a Holy Lent: by self-examination, repentance, prayer, fasting and self-denial; by reading and meditating on the Holy Scriptures. By this, you might make a new beginning right and repentant before Our Creator and Redeemer. Renew our Hearts, O Lord, and make right our paths to your righteousness. Soak me in your laundry and I’ll come out clean, scrub me and I’ll have a snow-white life. Tune me in to foot-tapping songs, set these once-broken bones to dancing. Don’t look too close for blemishes, give me a clean bill of health. God, make a fresh start in me, shape a Genesis week from the chaos of my life. Don’t throw me out with the trash, or fail to breathe holiness in me. Bring me back from gray exile; put a fresh wind in my sails! Give me a job teaching rebels your ways so the lost can find their way home. Commute my death sentence, God, my salvation God, and I’ll sing anthems to your life-giving ways. Unbutton my lips, dear God; I’ll let loose with your praise. Going through the motions doesn’t please you, a flawless performance is nothing to you. I learned God-worship when my pride was shattered. Heart-shattered lives ready for love don’t for a moment escape God’s notice. The truth is, no matter what, we all have to do laundry. It’s the basics of being able to have everything clean and presentable ready to be worn again, because face it, none of us wear something just once and throw it aside. I’m sure even the psalmist had to do laundry from time to time. thus the psalmist knew that laundry is not a delicate process either when this was prayed. Above, of course this is Eugene Peterson’s interpretation, other translations say something like: “purge me with hyssop and I shall be clean.” Each of these images, however, are quite violent. Though they seem rather mundane, every-day tasks hyssop and laundry each have a dark side. Hyssop was used and is a natural medicine that in small doses can suppress a cough, or clear out a nose. But In larger doses hyssop can cause epileptic reactions or vomiting truly causing a person to purge what is causing them to be ill. And laundry, really, is just as painful. In the ancient world laundry likely took most of a day. Without modern soaps or machines the dirt in clothing would often have to be beaten out, slapped on flat rocks or hit with sticks, run over course rocks, truly breaking down to the very cloth on which the stain or dirt resided. Washing machines today are no less violent than their ancient counterparts; we just don’t have to do any of the hard work. Instead, we have entire cycles that are just focused on agitation. And let’s not forget about that wonderful spin cycle. Now imagine it’s not your clothes in the ordeal, but you. I don’t believe the Psalmist prays to be slapped on rocks or hit with sticks. And I can’t say that I have ever prayed for this either. What the psalmist asks for soaking, to be infused with the water from heaven which cleanses to the core. When we pray for healing, cleansing, purification or sanctification, we also want it to be easy. The truth is, things like confession, fasting, sacrifice, or purity are never easy. What is most important, however, is a willingness to come clean, to be clean, to soak. I don’t know how it is at your house, but laundry is not something we just do once. In fact, when everything is washed, folded and put away, it seems that in less than 24 hours there is at least another 2-3 load. How does that happen? How is it that laundry is never done? Especially with a potty training two-year-old and an infant in our house laundry never stops. It doesn’t matter how much we wash, there is always something more to be done, weekly, daily, and sometimes hourly. Things like our clothing, seem to get dirty constantly. A snow-white life, a pure life, is only possible with frequent scrubbing. The beauty in this laundry imagery is how intimate it is, with respects to the ancient world. We don’t see God dumping us in a machine, and walking away, to simply let us get clean. Instead, God is the one patiently scrubbing out the dirt, again and again, no matter how often or deeply we are stained with sin. God works ankle deep in a river just waiting to gently, and sometimes, not so gently, wash the dirt out of us making sure every part of us is clean and white as snow. As we enter into the Lenten season, I hope these next 40 days will be our time to go from dirty laundry to clean, and that this would happen again and again in our lives, as we move towards the sanctification offered through the Holy Spirit. I hope, too, that this cleansing really agitates us, riles us up, and even makes us uncomfortable. Because in order for the deep stain of sin to be truly washed away it takes a good deal of patience, sacrifice, prayer and even fasting. It is what Lent is all about. As we move closer to Easter, we may become more and more like Christ in our closeness to God because of our allowing God to be at work through our sacrifice. We may find that we need to change our routines to do so, we made need to carve out more time out of our already full schedules, but it will be worth it. God chose to enter our dirty, earthy, stain-filled, human world to become closer to us. This is what John meant when he said: “the word became flesh and dwelt among us.” So why don’t we simplify our lives that we can hear His Spirit speaking to change and cleanse our lives into to something more beautiful than we could ever imagine. That out of these ashes, we might be something beautifully new and clean. Lent is a time set aside for God’s cleansing in our lives. 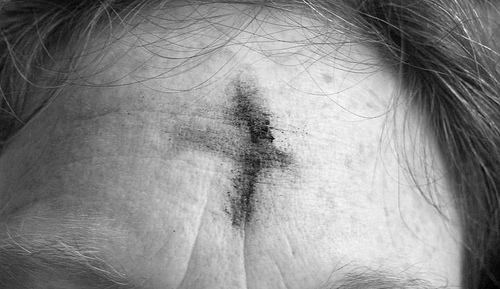 Today, Ash Wednesday, we begin this season by recognizing that we are mortal. That we will each, one day, die. Ashes to ashes and dust to dust. In the recognition of our mortality we see that we cannot be in control of our own lives. No! God is the one who has defeated death and conquered sin; God is the one who will resurrect us and make us new. God the Father, the Son and the Spirit can move us away from ourselves, turning us toward His Spirit’s guidance for new lives as His people, clean and prepared for Him alone. These next 40 days, let us think about our dirty laundry, perhaps while even washing a load or two, that God would give our souls a cleansing that they need to be made more in His image. None of us are brand new garments, we have our holes, our snags, our tares, our discoloration, but that doesn’t mean we also have to stay dirty. God takes us, as we are, garments full of holes, and breathes into us His holiness. Lent speaks into our lives that God doesn’t throw us away, out with the trash. Because we are not trash, we are God’s imperfect people, loved perfectly. It is for this reason He cleanses and takes care of us, and we can gather each Sunday and still celebrate the resurrection. We serve a risen Lord, who even as we walk through a season of sacrifice and death, speaks life into our weary, worn-out, dirty souls. Through this season we may truly become ready to receive God’s love; the love of sacrifice, the love of death, and the love or resurrection. From these ashes beautiful things are made out of us. Let us soak in Him and we will come out clean. have learned we have often failed to put into practice. Restore your love in us. Cleanse us, O Lord, and we shall be made whole. Loved this devotion, may I have your permission to use it in my Ash Wednesday service? Sorry, Just saw your message. Yes, you have permission to use as you would like. Thanks!